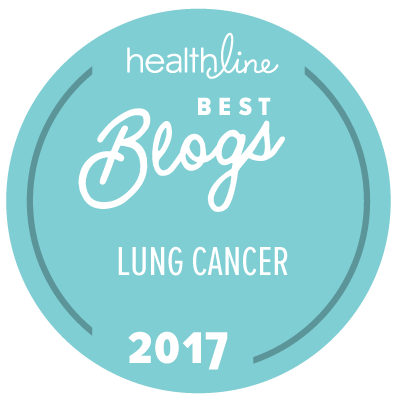 Home » Lung Cancer » Clinical Trial Check-In (February 2015) — Still NED! Clinical Trial Check-In (February 2015) — Still NED! Despite the phantom scan snafu (flew to Denver without my scans being scheduled) and a crazy busy schedule, this clinical trial trip to Denver has been great. I avoided the worst of the snowstorm, learned my new North Face Thermoball jacket keeps me toasty in subzero windchill, met my new great nephew Tate AND lung cancer advocate Kimberly Ringen (at different times), and participated as a patient advocate on the University of Colorado Cancer Center SPORE (an NCI-funded translational cancer research program). Oh, yeah, I also had a clean PET-CT scan and brain MRI. STILL No Evidence of Disease, 26 months and counting. My pulmonary embolism (diagnosed in December, but first appeared on scans in July 2014) is still present, but slightly smaller. Evidently the warfarin is working. My port certainly behaved well. Did I mention I’m STILL NED? This entry was posted in Lung Cancer. Bookmark the permalink. Amazing! 🙂 So happy for you! That is such good news!! !